This article is primary about the current flag of the Republic of Kosovo. For flags previously used in this territory, see List of flags of Kosovo. The flag of the Republic of Kosovo was adopted by the Assembly of Kosovo immediately following the declaration of independence of the Republic of Kosovo from Serbia on 17 February 2008. The flag is the result of an international design competition, organised by the United Nations-backed Kosovo Unity Team, which attracted almost one thousand entries. The now-used design is a variant of one proposal designed by Muhamer Ibrahimi. It shows six white stars in an arc above a golden map of Kosovo on a blue field. The stars symbolise Kosovo's six major ethnic groups. Before the declaration of independence, Kosovo was under the administration of the United Nations and used the UN flag for official purposes. The Serbian and Albanian populations had used their own national flags since the Socialist Yugoslavia period. The Serbs use a red, blue and white tricolor, which forms the basis of the current flag of Serbia. The Albanian population have used the flag of Albania since the 1960s as their nationality flag. Both flags can still be seen and used within Kosovo. The Kosovar flag flying at the Pentagon on July 18th, 2008. 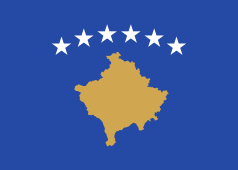 The flag of Kosovo has a blue background, charged with a map of Kosovo and six stars. The stars are officially meant to symbolise Kosovo's six major ethnic groups: Albanians, Serbs, Turks, Gorani, Romani (often grouped with the Ashkali and Egyptians) and Bosniaks. Unofficially, the stars are sometimes said to represent the six regions, which according to Albanian ultra nationalist ideology, make up Greater Albania: Albania, Kosovo, western parts of the Republic of Macedonia, parts of northern Greece, parts of Montenegro and Preševo Valley in southern Serbia. The flag of Kosovo resembles that of Bosnia and Herzegovina in terms of colors and shapes used (white stars and yellow shape of the country on a blue field). The flag is unusual among national flags in using a map as a design element; the Flag of Cyprus is the only other to do so. The ratio of the flag was announced during the contest as 2:3, however with the passage of a diplomatic protocol law in Kosovo in April 2009, the ratio was set as 1:1.4 (5:7 when put in whole numbers). The colors and construction of the Kosovo flag have not yet been defined; however, an official government document does give the colors of the flag using CMYK. The unofficial RGB values of the flag have been manually extracted since 2009. The use of the Kosovo flag is regulated by the law: "Law on the Use of Kosovo State Symbols". However, the Serbian Government objects to the use of the Kosovo flag at international meetings and gatherings. The Albanian flag is still used by the Kosovar Albanians. Serbia does not recognise the secession of Kosovo and considers it a United Nations-governed entity within its sovereign territory, the Autonomous Province of Kosovo and Metohija (Serbian: Аутономна Покрајина Косово и Метохија, Autonomna Pokrajina Kosovo i Metohija), according to the 2006 Constitution of Serbia. Even months after Kosovo's declaration of independence, the Serbian flag was still seen at official government buildings until officially replaced by the Kosovo Government. Flags of Serbia and Serbian Orthodox Church were used in global protests against Kosovo independence and still can be seen in Serb-majority areas in the north. However, a person was sentenced by a panel of EULEX judges on November 19, 2009, for inciting hatred by raising a Serbian flag on a mosque in the southern part of Mitrovica (among other charges of discord/intolerance and attempted aggravated murder of a police officer). Until 2008, Kosovo did not have a flag of its own. However, during different periods of history, different flags were flown in Kosovo. Before 1969, the only flags that could legally fly over Kosovo (then an autonomous province) were those of SFR Yugoslavia and SR Serbia. If a nationalist flag were flown, such as Albanian, Serbian or Croatian, a person could go to prison for doing it. In 1969, the Kosovar Albanian population was able to use the Albanian flag as its national flag. However, the flag had to be charged with a red star, since this was a common symbol of the Yugoslav nation. Even without this requirement, the flag of the People's Socialist Republic of Albania at the time had a red star, outlined in gold, above the double headed eagle. Later on, different nationalities in Kosovo could use their own national flags in accordance with legislation. Before the death of Yugoslav leader Josip Broz Tito and the breakup of SFR Yugoslavia, there were calls for the Albanian flag to be banned because residents in Kosovo did not want to live under a foreign flag. This sentiment culminated in the "Petition of the 2016", which called for, among other items, a greater statehood status for Serbia and the removal of all Albanian symbols. The Serbian side also began to remove the red star from the Yugoslav flag, using it for protests to counterbalance the Albanian population and to promote a "Greater Serbia". When Kosovo was under the administration of the United Nations, the UN flag was flown in Kosovo. However, the flag used by the Kosovar Albanian population was the Albanian flag. The Albanian flag was also used on public buildings, even though it was against UN regulations. Regulations stated only the UN flag and other authorised flags, like those of cities, could fly on public buildings. If the Albanian flag did have to go up, then the Serbian flag must go up too, according to UN regulations. However, this was never done in practice and the flag of Albania was ever-present in Kosovo during the UNMIK period. A competition for a new flag, held in June 2007, received 993 entries. Under the terms of UN talks, all such symbols would have to reflect the multi-ethnic nature of Kosovo, avoiding the use of the Albanian or Serbian double-headed eagles or the use of solely red and black or red, blue and white color schemes. Red and black are the colours used on the Albanian flag; red, blue and white are the main colours used on the Serbian flag. Additionally, all entries had to be rectangular and have a 2:3 proportion. The Kosovo Symbols Commission eventually selected three designs, which were then voted on by the Assembly of Kosovo (with a two-thirds majority required for approval), when independence was declared after the status talks. The three proposals selected were forwarded to the Assembly on 4 February 2008. Blue field with a white map of Kosovo surrounded by five stars. The stars vary in size and represent the different ethnic groups that reside in Kosovo. The largest star would represent ethnic Albanians. A vertical tricolour of black, white and red. A vertical tricolour of black, white and red with a spiral (Dardanian symbol of the rotating sun) in the centre of the white stripe. The assembly voted on 17 February 2008 to use a variant of the first proposal. The modified version has an additional star, makes the stars equal in size, switches the colours of the stars and map, makes the map bigger, and arranges the stars in a curve above the map. Original proposal of the adopted flag design. Ibrahim Rugova, the first president of Kosovo, introduced the "flag of Dardania" on October 29, 2000. 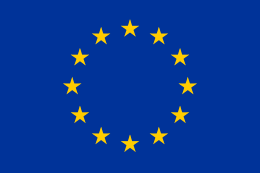 The flag was blue, inscribed with a red disc with a golden ring. Inside the red disc is the Albanian eagle. The eagle is holding a ribbon with the legend "Dardania" inscribed. Dardania is the name of an ancient region in the same general area as Kosovo, but is not officially recognised by any international power. This flag did not gain much popularity, but was occasionally used at cultural and sports events during the UNMIK period and was also used at Rugova's funeral to cover his coffin. It is still used as an unofficial presidential standard and by the two Rugovan political parties, the Democratic League of Kosovo and the Democratic League of Dardania. Prior to the declaration of independence, Kosovars displayed a flag featuring a map of Kosovo against a blue and yellow background, similar to the flag of Bosnia and Herzegovina. 1 2 3 4 "LIGJI NR.03/L-132 PËR PROTOKOLLIN E SHTETIT TË REPUBLIKËS SË KOSOVËS" (in Albanian). Gazetën Zyrtare Republika e Kosovës. 2009-04-16. Retrieved 2009-12-03. 1 2 3 Fawkes, Helen (2008-02-17). "Kosovo celebrates 'dream come true'". BBC News. Retrieved 2008-09-07. ↑ "Kosovo MPs proclaim independence". BBC News. British Broadcasting Corporation. 2008-02-17. Retrieved 2008-09-07. 1 2 Wander, Andrew (2008-02-08). "With independence looming, Kosovo to pick a flag". Christian Science Monitor. Retrieved 2008-09-07. ↑ "Prime Minister Thaçi meets designer of Kosova flag Mr. Muhamer Ibrahimi" (in Albanian). Office of the Prime Minister of Kosovo. 2008-02-23. Retrieved 2008-09-07. 1 2 "Parliament adopted the flag of Kosovo state". Retrieved February 17, 2008. , Kosovapress, Priština, 17 February 2008. 1 2 Reeves, Terri Bryce (2008-02-19). "Former Kosovar leader rejoices from afar". St. Petersburg Times. Retrieved 2008-02-19. ↑ Salihu, Mevlyde (2006-10-19). "OSCE Kosovo Mission helps push for greater integration of minorities". 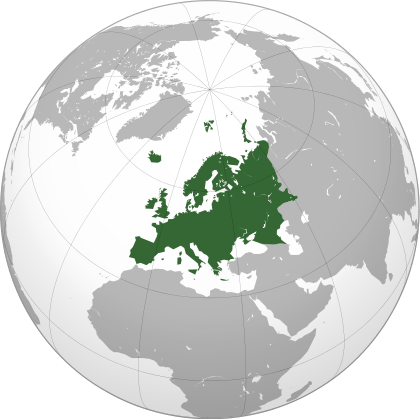 Organization for Security and Co-operation in Europe. Retrieved 2008-08-14. ↑ Judah, Tim (2008-02-22). "Could Balkan break-up continue?". BBC News. British Broadcasting Corporation. Retrieved 2009-10-16. ↑ Smith, Whitney (2001-05-01). Flag Lore Of All Nations. Millbrook Press. p. 18. ISBN 0-7613-1753-8. ↑ "About Cyprus — Cyprus Flag and Emblem". Government of Cyprus Web Portal. 2006. Retrieved 2009-12-26. ↑ For sporting events, the Korean Unification Flag uses a map of the Korean peninsula. See: "Unification flag, Arirang tapped for unified Korean team". Kyodo News International. 2001-03-19. Retrieved 2008-09-07. 1 2 "Kosovo Unity Team announces the COMPETITION FOR THE FLAG AND EMBLEM OF KOSOVO" (PDF). Kosovo Unity Team. 2007-06-13. Retrieved 2008-07-31. 1 2 3 "National Flag of Kosovo" (PDF). Office of the Prime Minister of Kosovo. 2008. Retrieved 2008-09-23. 1 2 "Important information about Flag and Coat of Arms of Republic of Kosovo". Kosovo Thanks You.com. 2009-01-26. Retrieved 2009-05-17. ↑ "2008/03-L038 Law on the Use of Kosovo State Symbols" (PDF). Assembly of the Republic of Kosovo. 2008-02-20. Retrieved 2008-08-15. ↑ "Hackers post Kosovo flag on Serb official site". Reuters. 2008-09-12. Retrieved 2008-09-21. ↑ The colours were derived from the CMYK via Inkscape. Note that there is no one single CMYK to RGB conversion (a proper conversion depends on colour reproduction characteristics of the chosen medium, the ambient lighting, etc. ), and that any programme which converts with an non-calibrated monitor as the display medium is not reliable. ↑ "Documents by Opinion and Study". Venice.coe.int. Retrieved 2009-07-20. ↑ "Kosovo flag flies in Serb enclave court for first time since independence". Koha Ditore. 2008-12-22. Retrieved 2009-12-26. ↑ Bilefsky, Dan (2008-05-11). "In Serbia, waving the flag but avoiding nationalism". The New York Times. Retrieved 2009-12-04. ↑ "Kosovo Serb sentenced for inciting hatred". Radiotelevizioni i Kosovës. SETimes.com. 2009-11-20. Retrieved 2009-12-04. ↑ Spencer, Metta (2001-02-02). The Lessions of Yugoslavia. Emerald Group Publishing. p. 289. ISBN 978-0-7623-0280-2. ↑ Elsie, Robert (2004). Historical Dictionary of Kosovo. pp. xxxvi. ISBN 0-8108-5309-4. ↑ "Zastave nasih naroda". Svijet oko nas — enciklopedija za djecu i omladinu II (IX): 403. 1985. Retrieved 2009-12-26. ↑ Peaslee, Amos Jenkins. Constitutions of Nations, Volume 3. p. 19. ↑ Krieger, Heike (2001-08-27). The Kosovo Conflict and International Law An Analytical Documentation 1974–1999. Cambridge University Press. p. 7. ISBN 0-521-80071-4. ↑ Filipović, Gordana (1989). Kosovo — Past and Present. p. 362. ↑ Dragović-Soso, Jasna (2002-10-09). Saviours of the Nation Serbia's Intellectual Opposition and the Revival of Nationalism. McGill-Queen's University Press. pp. 137–138. ISBN 978-0-7735-2523-8. ↑ Rogel, Carole (1998-05-30). The Breakup of Yugoslavia and the War in Bosnia. Greenwood Press. p. 49. ISBN 0-313-29918-8. 1 2 Lucas, Kristina (2004-11-08). Footsteps in Kosovo. Trafford Publishing. p. 142. ISBN 1-4120-2923-6. ↑ Holohan, Anne (2005). Networks of Democracy Lessons from Kosovo for Afghanistan, Iraq, and Beyond. Stanford University Press. p. 16. ISBN 0-8047-5190-0. 1 2 "Kosovo to pick a state flag". New Kosova Report. 2008-02-09. Archived from the original on 2008-05-26. Retrieved 2008-09-07. ↑ "Kosovo Starts Selection of its Future Flag and Emblem". Balkan Investigative Reporting Network. 2007-05-07. Retrieved 2008-08-14. ↑ "Priština daily speculates on independence date". Beta. 2008-02-05. Retrieved 2008-08-14. 1 2 Charter, David (2008-02-11). "Wanted: new flag and anthem for Kosovo". Times Online. London. Retrieved 2008-08-14. 1 2 "Kosovo (Province, Serbia) - Dardania (flag of uncertain status)". Flags of the World. 2008-02-23. Retrieved 2008-08-14. ↑ "Kosovo Television Debate: Kosovar flags and symbols". RTK. Balkan Investigative Reporting Network. 2005-12-21. Retrieved 2008-08-14. ↑ "Main Page" (in Albanian). Lidhja Demokratike e Dardanisë. 2007. Retrieved 2010-02-05. ↑ Pancevski, Bojan (2008-02-26). "Call for calm as Kosovo independence looms". Telegraph.co.uk. Retrieved 2008-08-14. Wikimedia Commons has media related to Flags of Kosovo.